Obituary – Self, Bruce « Perry High School Alumni Association, Inc.
Bruce Self, 35, former Perryan, died at 11:30 a.m. Friday, Feb. 21, 1992, at his home in Oklahoma City. Memorial services will be at 2 p.m. Tuesday in the chapel at Brown Funeral home. Rev. John McLemore, former Perry resident, will officiate. Self was born Oct. 17, 1956, at Fort Belvoir, Va., the son of Manuel and Shirley Self. 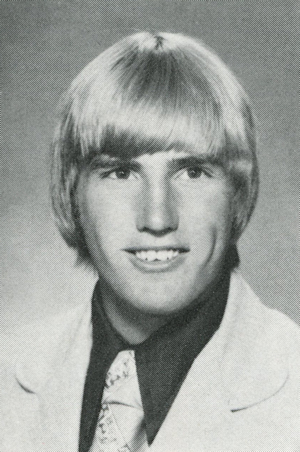 He was a 1975 graduate of Perry high school and a member of Sigma Nu fraternity. He was affiliated with the Christian church. He had worked for Sun Classic Films in Park City, Utah, then was film director for Channel 25, Blair Broadcasting, Oklahoma City. More recently, Self was manager for Record Bar stores, first working at Quail Springs and, at the time of his death, at Penn Square. In addition to his parents, Manuel and Shirley Self, Perry; survivors include one sister, Marcia Self, Oklahoma City; and one brother, Mark Self, Matlacha, Fla.
Memorials may be made to Larry Jones’ Feed the Children or Toys for Tots. Brown Funeral home will serve as custodian of contributions.